VA Funding Fee - Why is it Necessary and How much is it? Every time a home is bought or refinanced using a VA loan, the veteran, or borrower, must pay a VA funding fee. This charge is paid to the VA, allowing them to continue guarantying home loans for veterans and providing other services. You are essentially paying for the VA’s guarantee. In most cases, this cost can be financed into the loan, meaning it doesn’t have to be paid out-of-pocket at closing. One great benefit of a VA home loan is that the veteran, or borrower, is not required to pay monthly mortgage insurance. How is this possible? Well, mortgage insurance is often required on conventional and FHA mortgages and is paid by the borrower to protect the lender from losses that could result from default. This insurance is not necessary for a VA loan because the VA’s guarantee takes its place. A lender who offers a home loan to an eligible veteran or active duty member of the military is insured to a certain extent. If a loan defaults, the VA will pay the lender 25 percent of the total amount to cover some of the losses. This guarantee is what allows lenders to offer lower rates, no down payment options, and better terms on VA approved loans. But what makes this guarantee possible? It’s all because of the VA funding fee. Find out how much this fee is, how you can pay it, and why it matters. The amount of the funding varies depending on what type of loan is being obtained and whether a borrower has used VA eligibility before. It is also waived altogether if the veteran has a service-related disability rating of 10 percent or more. The funding fee is calculated as a percentage of the loan amount, and below are details on how much each borrower must pay. The VA funding fee for regular military veterans on a purchase loan is 2.15 percent for first-time use of their eligibility and 3.30 percent for each subsequent use. The funding fee for Reserves and National Guard members is 2.40 percent for first time use and 3.30 percent for each subsequent use. The fee is reduced to 1.50 percent for regular military and 1.75 percent for Reserves and National Guard members if you pay a down payment of 5 percent or more. It is reduced further to 1.25 percent for regular military and 1.50 percent for Reserves and National Guard if you pay a down payment of 10 percent or more. Cash-out refinances have the same funding fee amount as a purchase loan. Regular military are charged 2.15 percent for first time use and 3.30 percent for each subsequent use. Reserves and National Guard are changed 2.40 percent for first-time use and 3.30 percent of each subsequent use. An IRRRL, or streamline refinance, is used by a veteran who already has a VA home loan and is simply refinancing to another VA loan for lower rates or better terms. Unlike other options, the VA funding fee is only 0.50 percent on an IRRRL for all veterans. Refinancing a conventional or FHA loan to a VA loan is not considered a streamline refinance, and the funding cost amount in this case would fall under the same guidelines as a cash-out refinance. You sustained a service-related injury. You are receiving compensation for a service-related injury. You would be receiving disability compensation were you not already receiving retirement pay. You would be receiving disability compensation had you not been recalled to active duty. You are the surviving spouse of a service member who was killed in action. You are the surviving spouse of a service member whose death resulted from a service-related injury. To learn more about who qualifies for a VA funding fee exemption, visit the VA’s website. There are some instances in which you could qualify for a refund of your VA funding fee. If you close on your home while your disability reward is still pending, you can contact the VA and request a refund once it’s received. How the fee is refunded to you will depend on how you paid it; if you paid the fee in cash, you’ll receive a cash refund. If you financed the fee into your loan, the amount will be deducted from your principle. You can also contest an overcharge of the VA funding fee, and the VA will pay you back the difference. The VA funding fee is kind of like the VA’s cheaper answer to private mortgage insurance (PMI). Your PMI is paid monthly, and the amount depends on the size of the loan, state of the market, and your financial history. The VA funding fee, on the other hand, is paid only once. Usually, PMI costs as much as 1-5 percent of the loan amount annually. For example, if your PMI rate is 5 percent and your loan amount is $200,000, you’ll be paying $10,000 in PMI over the next five years. Compare this to a VA funding fee of 2 percent, which will cost you $4,000. That’s less than half of what you would pay in private mortgage insurance. While the VA funding fee is a one-time payment per loan, you will have to pay the fee again if you refinance. However, refinancing with an Interest Rate Reduction Refinance Loan (IRRRL) will bring the funding fee amount down to only half a percent. While fees are never fun, the VA funding fee has a very good purpose. By paying the fee on your loan, you are helping to fund these VA guaranteed programs that help countless veterans obtain well-deserved housing with affordable terms and rates. Knowing this doesn’t change the amount of the VA fee, but it can help you feel more comfortable paying it. 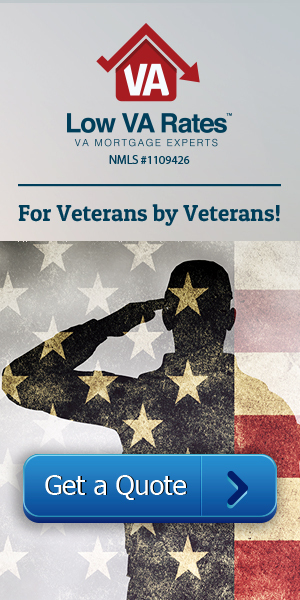 Here at Low VA Rates, we take pride in helping veterans understand their housing benefits and we salute their service. Please contact us today to learn more. VA Funding Fee Refund: Are You Eligible?